Some of the illustrations in old manuscripts are the best visual portrayals of life and manners of the Manipuri people, particularly in the 18th and 19th centuries. Such illustrations and drawings may or may not be relevant to the contents of the manuscripts. A few examples are taken up here. mellowed under its influence and the upper strata of the society were getting occupied by priests and monks. In the said illustration, these changes are presented artistically with symbolic figure of wild birds and a monk (Fig. 123). In other Subika manuscripts of this period, there are illustrations in which some persons in a group are shown drinking fermented wine - a social practice common on festive occasions in those days - with long pipes from the same pot (Fig. 33 no. 21, Fig. 89, 107, 112 no. 3, Fig. 120 no. 2). They indicate a certain mutuality of feeling among the people. When, in many illustrations, an elephant and a horse are shown together in their frontal and rear positions, it conveys the fact of frequent wars or battles during the period, because the elephant and the horse symbolize the king and the general respectively (Fig. 25 no. 3). Fig 3 to Fig 22 - Browse it as a Photo Gallery here. 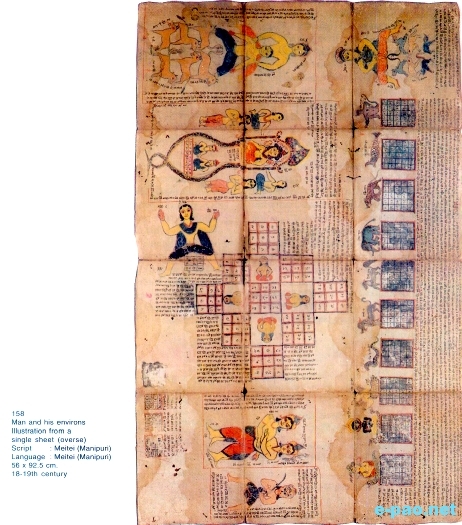 That Manipuris practiced tantric rituals can be deduced from the illustrations. There is the figure of a peacock sitting on a snake that signifies the possession of superhuman powers of causing harm to someone. The prevalence of tantric belief in Manipur is corroborated by the archaeological finding of a gold peacock and a bell-metal snake measuring 2.5 cm in height and 12.5 cm in length inside a chaisel, a traditional bell-metal utensil, from excavations in 1968 at Kangla, the ancient palace of Manipur. The utensil was found very securely protected by iron rods and bricks. The amaiba or priests and amaibi or priestesses who are knowledgeable about tantric practices have interpreted the finding of the utensil with its contents in such fashion as somebody's determined and secret intention to cause harm to the then king. Fig 23 to Fig 34 - Browse it as a Photo Gallery here. In Paphal Lambuba manuscript, there are drawings of 364 Paphals of different shapes and colours (Fig. 124 -154). The seven traditional yek-salai or clans of the Meiteis have their own specific colour codes. These colours are reflected in Paphal drawings about them. Other manuscripts also contain Paphal drawings in which both the head and tail of the python are sometimes depicted like flowers (Fig. 156). The Paphals are generally believed to possess supernatural powers as various tantric symbols, alphabets and mantras are inserted inside and outside the Paphal. Some people used to draw the Paphal on the wall above the main front door of the house in the belief that it would protect the inmates from evil spirits, etc. In every Paphal drawing, the head of the python is shown biting the tail. It is believed to symbolize the continuity of life cycle, the emergence of life from the Creator and its immersion into Him. It signifies order and tranquility in the universe. The body of the python in the Paphal being intertwined, one part lying above another in succession, is also interpreted as symbolizing the male-female union as begetters of the offspring. Available Paphal drawings may be broadly divided into three types. The usual type has the head of the python biting its tail. It suggests serenity. The other type, in which the head does not bite the tail, denotes fear and aggressiveness. Still another type depicts an animal that slithers on its belly but is not a python. However, a manuscript called Ningthou fi saba suggests that Meiteis of the past treated all animals that moves on their belly, including lizards, as coming under the category of pythons. The position of the python's head in the Paphal also creates three sub-types. If the head is in the upper portion of the Paphal, it is the sign of high intellectual accomplishment. Calmness and control are indicated if the head is in the middle portion of the Paphal. Sometimes, the head and neck of the python are shown as if bending backwards. This motif denotes versatility, an ability to work in both worlds. Traditional martial arts exponents follow specific Paphal patterns in their body movements with a spear, depending on the objective, that is, whether it is for offensive or defensive purpose. In Lai Haraoba also, to usher in prosperity to the society and for the wellbeing of future generations, the maiba- priest, maibi-- priestesses and pena sakpa lead the men and women to a dance that follows the twists and turns of the python in the Paphal. 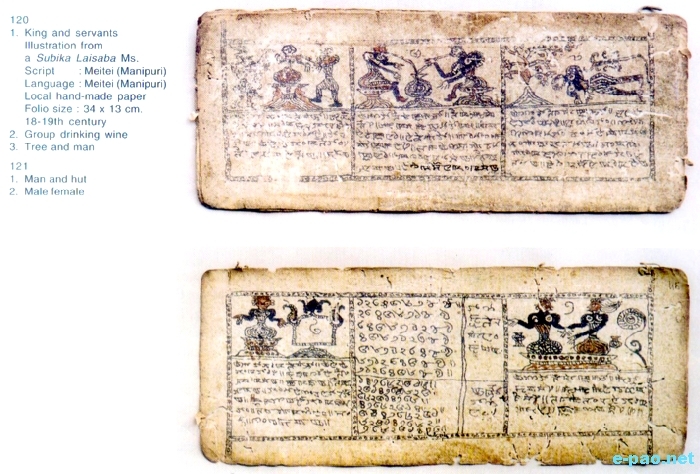 A number of illustrated manuscripts also depict local folk beliefs, for example, in Numit Khenchanglon. Figures in miniature of different animals, birds, fishes, parts of the human limb etc. are drawn mostly within circles representing the sun and the circles have a diameter of not more than 2.5 cm. Animals usually found in the manuscripts are lion, elephant, horse, peacock, crow, fish, tortoise, snake, python, otter, etc. Such illustration reflects the folk belief that, if a particular figure is shown inside or outside the sun, it portends a calamitous event or indicates good fortune for the king and the country. The border of the sun is in red colour, the inner space in yellow, and the figure are painted in black, blue or white colour. P. Gunindra Singh, Manipuri Numismatics, published by Mutua Museum, 1983. 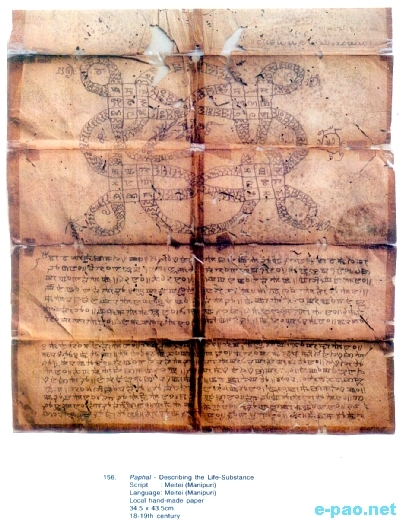 N. Indramani Singh, Seminar Paper, The old manuscripts and Its indigenous methods of preservation and conservation in Manipur, MRC & Manipur State Archives, January 2005. Mutua Bahadur, Seminar Paper, Different indigenous materials used for writing the old manuscript and their conservation technique, MRC and Manipur State Archives, January 2005.
" This work originates from seeing the scattered illustrated manuscripts, which I found in the custody of our local Pundits. Since 1973 I have been working for these manuscripts by collecting from various sources. Some of them are already published in the Book entitled the Manuscript Paintings of Manipur in 1978. Even the second reprint issue is also produced in this year. But unfortunately it could not be printed in colour due to financial constraint. All the paintings consisted in the earlier publication are coloured by freehand. I have the opportunity to exhibit some illustrated manuscripts in the 2 day seminar organised by Manipur Folklore Society held from 26 to 27 September 1982 at G. M. Hall, Imphal. This exhibition attracts many scholars from different parts of India. 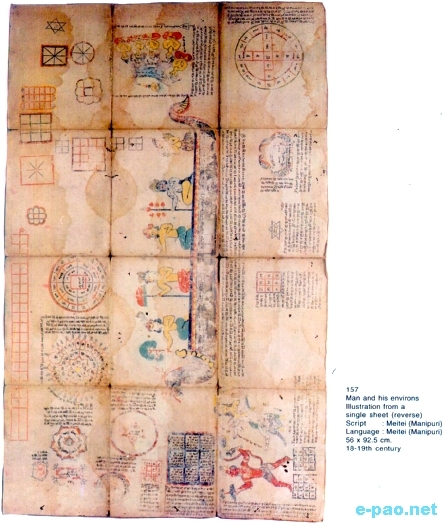 Then in 1991, published another book entitled Subika Laisaba (A Manipuri illustrated Manuscript on Astrology). 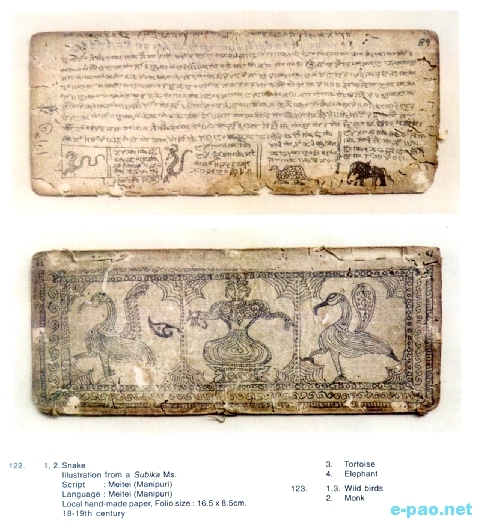 The present work on illustrated Manuscripts is a bunch of paintings collected from different parts of Meitei inhabited areas like Bangladesh, Myanmar etc. It will incorporate 364 faces of Paphal and other unpublished manuscripts. I would like to convey my thanks to the Ministry of Culture, Government of India for the financial assistance to the task of publishing it. I hope that without this support it could not have been possible to materialise the things. I alone am responsible for any remaining errors and infelicities for they are of my own construction. I always welcome suggestions and criticisms for further development in future." * Mutua Bahadur contributes to e-pao.net regularly. This article was webcasted on February 21st 2010.